Good old American apple pie, a staple of American dessert. The aroma of fresh apples and cinnamon baking in the oven is so enticing to just about everyone. With the cooler nights approaching, this will create a heavenly scent that no one will be able to resist. 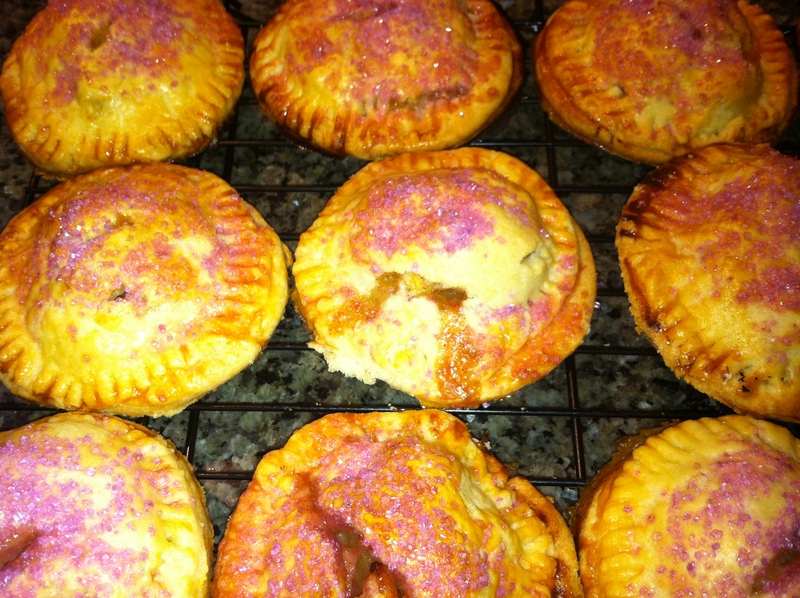 But how about individual apple pies? No sharing involved, now that’s a sweet treat! I love to bake and cook with apples. They are so good for you, hence the saying, “An apple a day keeps the doctor away” goes a long way. Apples are great for your teeth and gums. They won’t replace your toothbrush, but when you bite down and chew on the apple, they will stimulate a production of saliva in your mouth, reducing tooth decay by lowering the levels of bacteria in your mouth. Say cheese! The soluble fiber found in apples binds with fats in the intestine, which translates into lower cholesterol levels and a healthier you. This soluble fiber is the key to blunting blood sugar swings. This aids with type 2 diabetes and reduces cholesterol. Scientists have also linked the free radical-fighting power of the antioxidants contained in apples for Parkinson’s disease. Scientists from the American Association for Cancer Research, agree that the consumption of flavonol-rich apples could reduce your risk of developing pancreatic cancer. So, with all that being said, eat more apples!!! These delicious little, delicate cuties use the same ingredients as a 9 inch pie, except they are cut out into individual 3 inch size servings. To save some time and arm workout I used a store bought pre-made pie crust dough. Yes, I know it’s not home made, but sometimes you need to give yourself a little break. For that added eye appeal, I sprinkled them with pink and purple sugar. No need to fight for that first or last piece! Just Enjoy! Remove the dough from the refrigerator and unfold it onto a well-floured surface. Place six of the dough circles on a Silpat or parchment paper-lined cookie sheet. Spoon a small portion, about a tablespoon of the apple filling into the center of each circle, leaving enough of a border around the filling. Place a second dough circle atop each filled circle then use a fork to crimp the edges together, sealing each pie. Brush each pie with the egg wash, and using a sharp knife, cut a vent on the top of each pie. Sprinkle the pies with crystal sanding sugar (optional). Bake the pies for about 15 minutes, or until they’re golden brown. Turn them halfway through baking. Another delicious item from the best gourmet kitchen, EVER!!! Cannot wait to sample one of these! Another delicious looking entry from the best gourmet kitchen, EVER!! Cannot wait to try one of these tasty treats! Yes, this is a fun pie to prepare, especially with children. Let me know how they turn out!